Karen Clarkson is a Choctaw artist who embraces her rich heritage through an abundance of mediums. As a self taught artist she has created drawings, paintings, mixed media designs, ledgers, and much more with her adept talents. Although many of Karen’s works are based on Native Americans, she also creates landscapes and still life as well as portraits in other mediums. A unique style of work Karen creates are her Choctaw ledgers, which tell the story of her people during formidable times. The ledgers illustrate the history and effects of the government on the Choctaw. Karen’s series entitled A Choctaw Story of Land and Blood, feature the documents of her own ancestors including photographs, birth certificates, land allotments, and more. She takes these documents and paints images on top of them in order to tell a story of some of the disastrous consequences from these times. This uncommon medium captures the pain and suffering in a captivating way while creating a new way of viewing the past. Karen is particularly drawn to the human form in all its strength and beauty. She recalls some of her earliest childhood memories drawing different people. Being self taught has encouraged Karen to experiment, although she does continue to return to the human form. Gregory Lomayesva is an internationally recognized painter, sculptor and mixed-media artist who lives and works in Santa Fe, New Mexico. He draws imagery and ideas from his Hopi and Hispanic heritage and American popular culture. The contrasts of his mixed cultural upbringing led him to his keen observational style and ability to comment with razor-sharp precision on those elements in our world that most make us what and who we are. His artistic vision has roots in Pop Art and is expressed in the bold palette and motifs of his paintings and wood carvings. Gregory draws from the iconic period in American art when his idols Lichtenstein, Rauschenberg, Warhol and Pollock redefined how culture could be captured on canvas or in form. This paved the way for his generation to define further our blended cultural reality. Gregory believes it gives him permission to appropriate in their footsteps not only more familiar American iconography but the Hispanic and Hopi iconography that equally informed his particular worldview. Today, Gregory boasts a body of work that includes thousands of canvasses, woodcraft artifacts, and other ephemera, a collector-base that stretches from the US, Europe, and Asia, and representation in New York, Los Angeles, Washington, D.C., Scottsdale, and Santa Fe. He has a keenly evolving aesthetic sensibility that combines abstract imagery with razor-sharp observations that are at the cutting edge of American contemporary fine art. 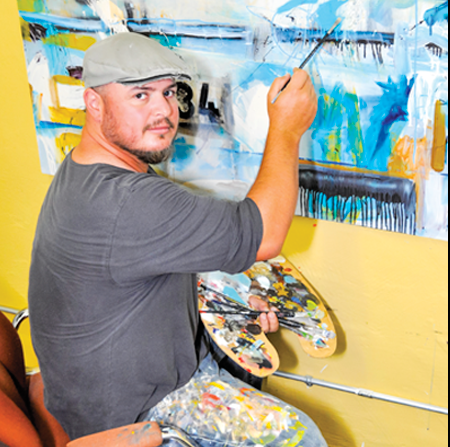 Rhett Lynch is a diversely talented artist who has found expression across a wide variety of mediums. Although varying greatly in medium and subject matter, all of Rhett's work contains a common thread: intensity of color interwoven with multifaceted intent. In his over forty years working as a professional artist, Rhett has created hand-woven tapestries, sculpture, drawings, monotypes, and paintings in oil and acrylic, as well as writing and acting in films. Always seeking to expand his visual vocabulary, Rhett consistently experiments with various materials in order to bring more power, life, and intensity to his art. Rhett's broad range of subject matter: the human form, animals, landscapes, icons, archetypes, myth and legend, are depicted realistically to pure abstract, whimsical to mystical. Rhett refers to his work as a visual journal, recording his experiences as a tourist of life. His work is a testament to the deeply powerful symbols found in the well of his Indigenous heritage. Viewing Rhett's works provides an interactive experience provoking thought, evoking emotion, and leaving a lasting imprint on the psyche. Rhett's work, which has appreciated consistently in value over three decades, attracts a broad range of collectors, veteran as well as neophyte, from entertainment and political personalities, to church parishes and corporations such as CNN. Abraham Mojica is an international artist who creates his pieces using multiple materials and mediums to produce jewelry, accessories, handmade doors, furniture, ceramics, sculpture, paintings and drawings. Abraham’s work is greatly informed by the adventurous twists and turns he has experienced since leaving Guadalajara, Mexico at age 19. Using boldly gestural brush strokes, he unabashedly delights in creating striking canvases where figurative subjects, often negotiating a visual language of shape and color, evoke distant memories and dreams. A variety of unique life experiences have inspired Abraham’s art including playing in bands, instructing karate, and spending a few years with a traveling circus. This instilled in him a passion for discovering new horizons, which in time developed into deep artistic talent. His artist's eye, a natural sense of form and balance, and unique voice give every piece a soul all its own. Abraham typically uses the unique method of using both hands at once to paint his pieces. The artist is based out of San Antonio, Texas but has works available internationally in countries including Japan, Germany, Belgium, France, Australia, Canada, and Argentina. 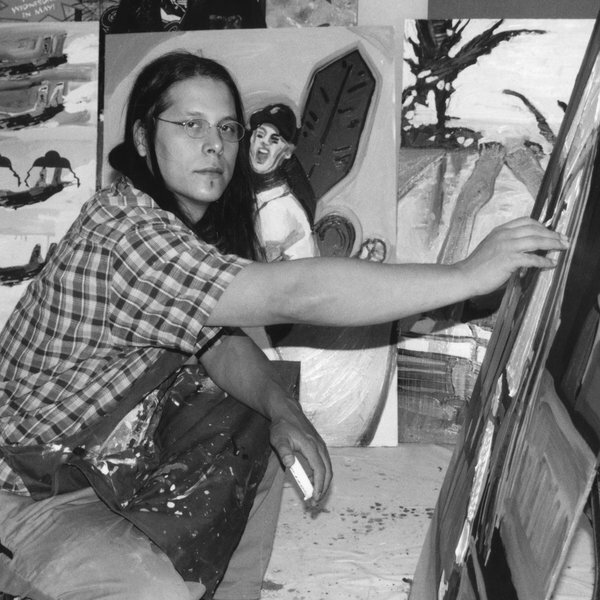 Mateo Romero is a contemporary Pueblo painter with roots connecting to the Southern Keresan Cochiti people. Mateo’s paintings reflect a pattern of evolution and change. The images are powerful and imposing, juxtaposed with swirling gestural paint marks and drips. Timeless, archaic elements of Pueblo culture are juxtaposed with contemporary abstract expressionist palette knife and brush work. Overall, the paintings develop a rhythmic, hypnotic, trancelike feeling which is referential to the metaphysical space of the Pueblo and the dance itself. Mateo was born and raised in Berkeley, California. Although his cultural background is an urban one, it is through his father Santiago Romero that he is connected to their Southern Keresan Cochiti people. This experience includes much of the Rio Grande Pueblo world as well. Mateo attended Dartmouth College and studied with acclaimed artists Ben Frank Moss and Varujan Boghosian. Mateo received an MFA in printmaking from the University of New Mexico and is now an award-winning artist who has exhibited internationally in Canada and in the United States. He is currently a Dubin Fellow in painting at the School of American Research in Santa Fe, NM, and paints in his studio also located in Santa Fe. 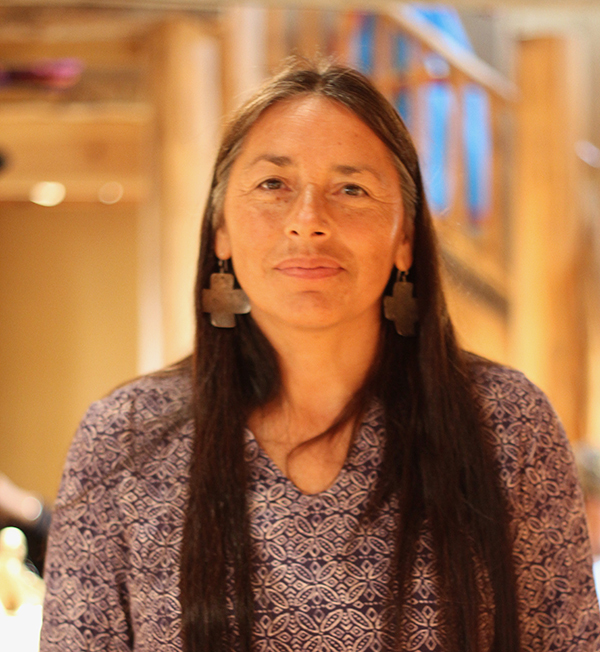 Roxanne Swentzell is a clay sculptor from the Santa Clara Pueblo whose work is in high demand. She uses clay to create full-length figures that represent the complete spectrum of the human spirit. Her figures represent a full range of emotions and irrepressible moods. Roxanne feels that many people are out of touch with their environment and hopes relating to her expressive characters will help them get back in touch with their surroundings and feelings. She tends to focus a lot on interpretative female portraits attempting to bring back the balance of power between the male and female, inherently recognized in her own culture. Additionally, she increasingly uses a powerful sense of humor to communicate. Like in classic Pueblo pottery, Roxanne crafts her figures from clay that she squeezes into thick coils and joins together to build the walls of her figure. During the process of coiling, she keeps the clay moist and uses a knife or stone to smooth over the ridges of the coils. While the figures are hollow, the toes and fingers of each figure is solid. She leaves vacant space at the core of her figures in order to reduce the chance the figure will explode in the burner while baking. The final figure Roxanne produces is often painted and can include painted details of eyes, hair or clothing on the figure. Her work is in such high demand that people line up by the dozens at her booth at shows like Santa Fe Indian Market. Though steeped in her own culture, Roxanne’s work demonstrates an astounding universality, speaking to people of all cultures. Felix Vigil is a classically trained fine artist whose contemporary vision is influenced and guided by the spirits of his Jicarilla Apache and Hemez ancestors. His body of work includes painting, sculpture, film animation, architecture, and literature. Ideas for his work come out of the ceremonies, songs, and stories of his people. It is inspired by ideas that are very old, but those concepts are still very relevant today. Felix considers his work contemporary meditations on ancient themes that depict traditional symbols in their essential forms and bring them to life with saturated colors and stylized representations of animals and geographic features of the land. Since early childhood Felix was surrounded by art. His father, Francis Paul Vigil was a prominent self-taught artist who set the course for Felix’s artistic endeavors. After his father’s passing he began the process of following his own dreams of becoming an artist. In 1980 he graduated with honors from the world renowned Maryland Institute College of Art in Baltimore, Maryland with a BFA in painting. Felix has gained national recognition and won numerous awards including a permanent display at the National Museum Of The American Indian, Smithsonian in Washington, D.C. Felix has works located across the country, along with pieces in private homes both nationally and internationally. Adrian Wall is a renowned sculptor from Jemez Pueblo. While his primary medium is stone, he works with many materials, including clay, bronze, and glass. 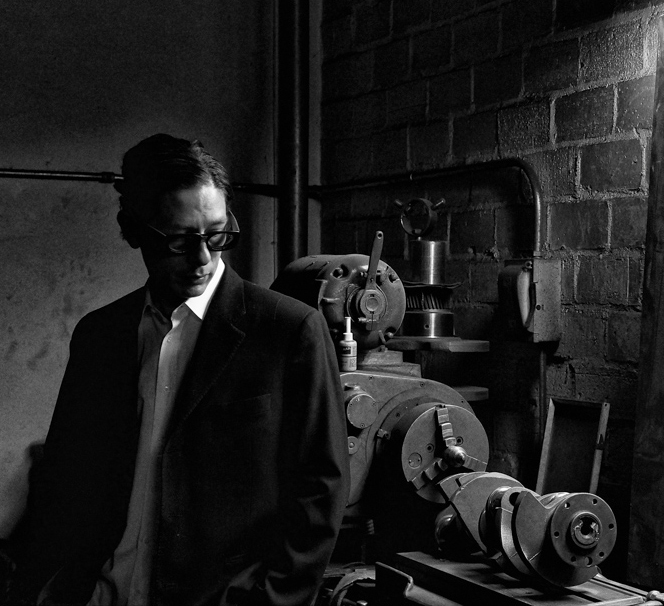 Adrian’s work can be found in museums and private collections across the United States. The subjects of Adrian’s sculptures most often relate to his Puebloan heritage. Stylistically, he is well known for blending figurative detail with abstract forms. Adrian’s most recent sculptural explorations involve interpreting pueblo pottery designs and symbols in three-dimensional forms. Adrian is interested in combining materials to create sculptures that reflect his aesthetics. He sees his work as a reflection of his existence as an aboriginal person experiencing the world in the Twenty-First Century. Adrian has a background in art that is grounded in the Native American Arts Movement which started in Santa Fe, NM in the Mid-Sixties. He has spent the majority of his career making art for collectors of native art. Through his educational pursuits, he has reinvigorated his approach to art including conceptual sculpture that brings light to issues that center around identity, inter-human relationships, and the environment, which manifest themselves in his sculpture. Adrian has won several major awards and is a member of the Indigenous Sculptors Society, an elite group of Native American Sculptors dedicated to the advancement of stone sculpture. He is currently pursuing a BFA at the Institute of American Indian Arts in Santa Fe, New Mexico.